Image: María de Jesús Patricio (Marichuy). Source: presencianoticias.com [edited]. An extraordinary phenomenon is taking place in Mexico: an Indigenous woman representing an Indigenous Governing Council has launched a campaign to run as an independent candidate for the nation’s presidency in the 2018 elections. In a racist and machista country, where electoral parties monopolize the political spaces and social imaginaries, her candidacy is poised to destabilize the practices and discourses of power. María de Jesús Patricio, known as Marichuy, is a Nahua traditional healer. 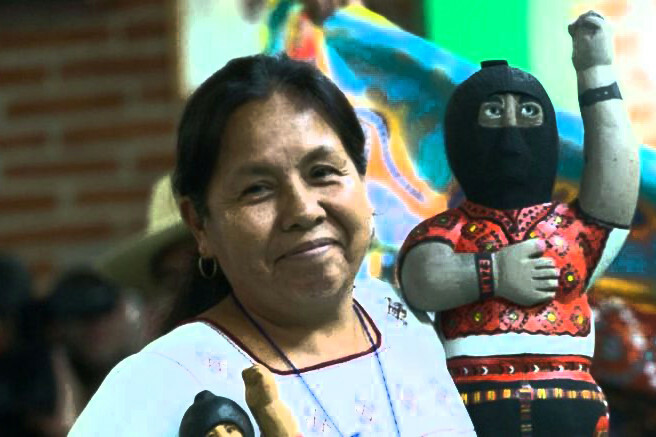 Since the Zapatista uprising in 1994, she has gained national recognition as a voice for Indigenous women and their peoples and for her denunciations of the violent and destructive effects of capitalist development on nature and Mother Earth. Her voice is a collective one, as is her candidacy, which challenges many of the fundamental principles of liberal democracy—a liberal democracy that speaks of equality while promoting economic policies that deepen inequality, and that calls for the individual, free, and secret vote by way of political parties whose members have blood on their hands. Given the political parties’ corruption and complicity with the violence and impunity that plagues the nation, an important sector of Mexican society is seeking other forms of understanding and exercising power outside the party system. The concept of dignity has been central to the Zapatista struggle as a political principle for confronting racism and the disqualification of the Indigenous citizenship. This concept encompasses the demand to respect life in all its manifestations, as the basis for confronting multiple forms of violence. Marichuy, inspired by the Zapatista women’s struggle, reminds us that “dignity is helping a new world to be born in the midst of the destruction, pain, and rage of our peoples, those of Mexico de abajo, the underdogs in the countryside and the cities.” Her voice speaks for the dignity of those excluded from the national project. Her speeches not only denounce the violence we women experience, but they also lay claim to our political power by talking about the role played by the mothers of the disappeared “in their tireless struggle to find truth and justice within the debris.” She reminds of the role played by Indigenous and peasant women in defending land and territory, and she called on all women to “organize ourselves, yes, to demand respect for our own rights, but also those of everyone else, because we have the power to push forward this enormous struggle.” As a woman, as a feminist, and as a Mexican citizen, I feel called upon by her message, which gives me hope during these dark times. To recover dignity is to dare to imagine other paths and other possible futures. Political parties are in crisis, and citizens are increasingly looking to independent candidates, a phenomenon that further threatens the establishment parties that benefit from the budgets allocated by the country’s electoral system. As a result, lawmakers have established rules to make it ever more complicated for independent candidates. The electoral law requires that in order to become a presidential candidate, Marichuy must gather by February 1, 2018 a total of 866,593 signatures distributed among at least 17 states that represent a minimum of 1% of the electorate in each state. However, unlike in the past when written signatures could be collected using a photocopy of the electoral roll, now the collection must be done using a smartphone with two gigabytes of memory—that is, an Android 6 or Iphone 6 or higher. In a country like Mexico marked by profound social inequalities, this requirement effectively excludes entire segments of the population who have neither the technology nor access to the Internet service needed to download the National Electoral Institute’s app and upload the photos of their voting credentials. In response to protests by the legal team supporting Marichuy, this requirement has been removed in some Indigenous municipalities characterized by extreme poverty. However, this does not resolve the problem in the majority of poor rural and urban areas of the country. Currently, the campaign has more volunteers ready to gather signatures than it has the necessary equipment. I dare to talk about technological racism because technology is being used not to build bridges and articulate struggles but to exclude those who have the fewest resources, which in Mexico includes the majority of the Indigenous population. In the context of racialized geographies characterized by the unequal distribution of public spending and violence, many of the municipalities most affected by the violence of the narco-state are also those without the resources to access this type of technology. We are in a race against technology and bureaucracy in a political terrain marked by racism and inequality. However, the very fact that in Mexico today a movement is gathering around an antiracist, anticapitalist, and antipatriarchal agenda is a very important first step. It is a movement that puts respect for Mother Earth at the center, that opens possibilities to imagine other forms of doing politics and of understanding power, and in which mandar obedeciendo (to lead by obeying the people) and community service are fundamental to exercising authority. This blog is an invitation to support the nomination of María de Jesús Patricio so that the voices that until now have been excluded and silenced in the electoral arena can be heard. * Aída Hernández Castillo is a researcher and professor at the Centro de Investigaciones y Estudios Superiores de Antropología Social in Mexico City. Note: A previous version of this article was published in the Mexican newspaper La Jornada on October 26th, 2017. Translated from Spanish by Edward McCaughan.